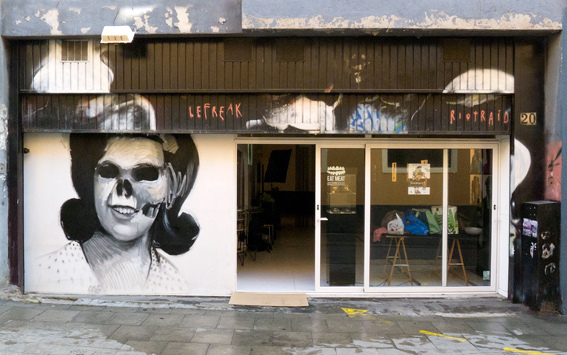 Eat Meat and Olimax invite you to participate in an all day mass portrait event, Homage to Catalonia, on 26th November, for a forthcoming exhibition and book. You, the subject, are asked to bring a relevant item, to be included in your portrait, that represents Catalonia or Barcelona to you. Be imaginative with the theme as this performance is, most importantly, a collaboration between you and the artist. British tapas and local colour all day. 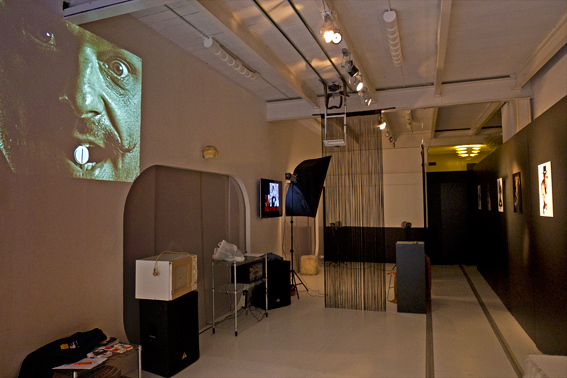 setting up a makeshift photographic studio inside the Eat Meat Gallery, for a one day shoot. 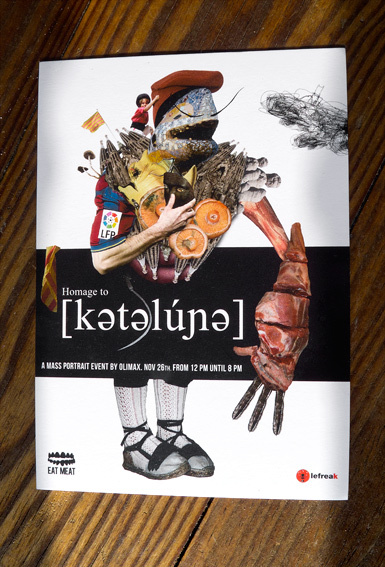 Katy and Rai, of Eat Meat, gave us a tremendous amount of support, encouragement and insight into Catalan culture. Anyone who made the effort to come could participate as long as they’d brought something of relevance to them and Cataluña. 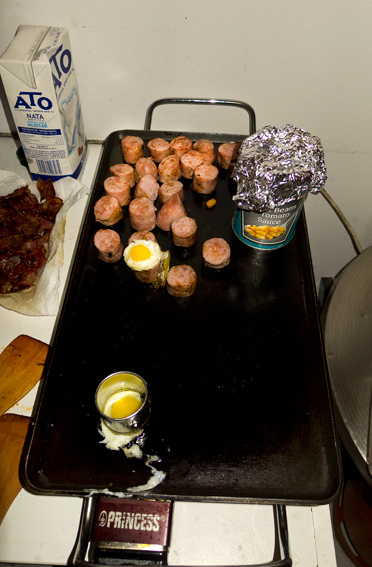 Chefs Alfredo and Zim slaved away in a back storage area producing British tapas. DJ Lou Young played some mellow tunes to keep us all calm and Matthew handled crowd control, while Oli looked serious and took pictures. 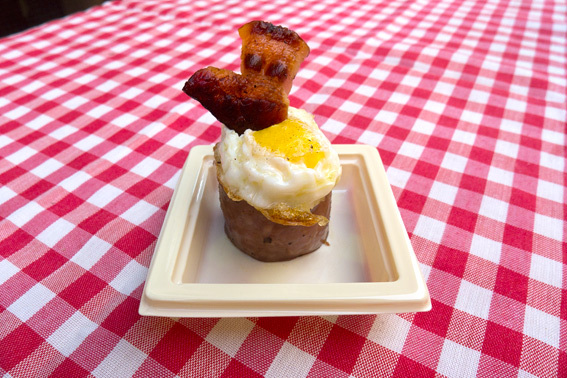 I think the English Breakfast was Alfredo’s concept – a slice of sausage (Butifarra), with a fried quail’s egg and two little pieces of bacon. Variations on the theme came with baked beans and half cherry tomatoes. 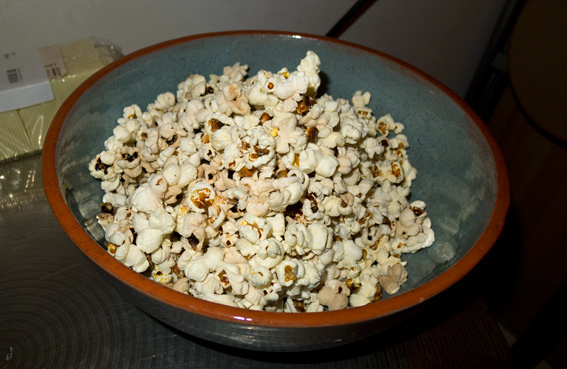 Meanwhile, Zim produced bowls of Popcorn, sprinkled with Truffle Oil – it tasted amazing! 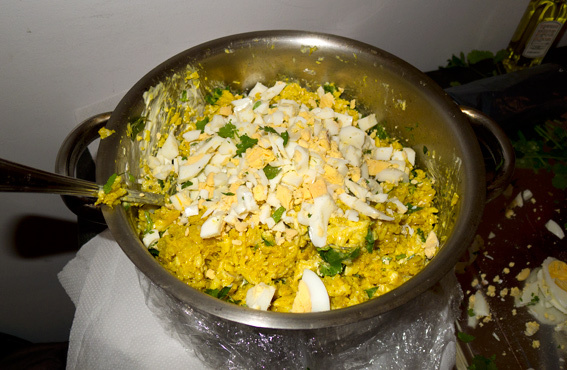 The Kedgeree was finished off, by adding hard boiled eggs, Crème Fraiche and Coriander. 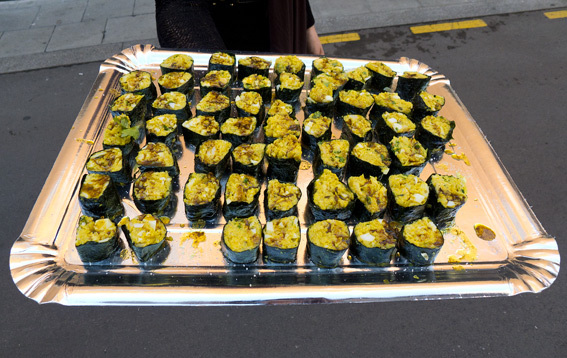 To turn Kedgeree into tapas, it was rolled in seaweed, like Japanese sushi. 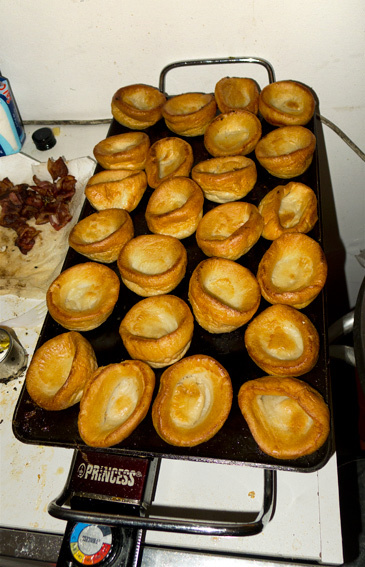 heated up previously made Yorkshire Puddings on the griddle. 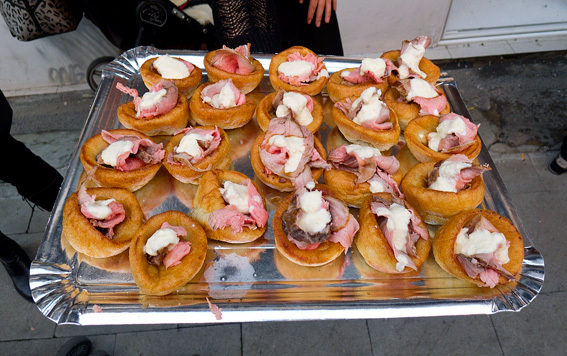 with Horseradish and Crème Fraiche to make unbelievably delicious Roast Beef tapas. 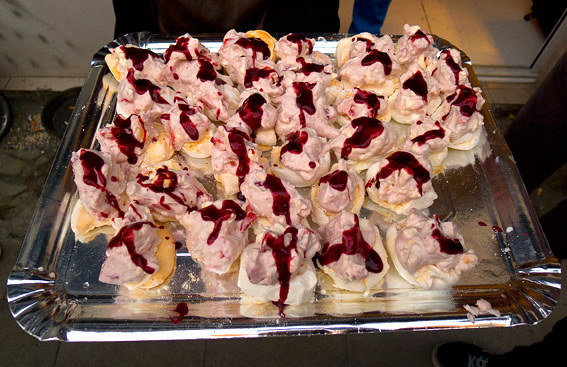 Zim had made little Meringues, the night before, in order to create mini Eton Mess puddings. 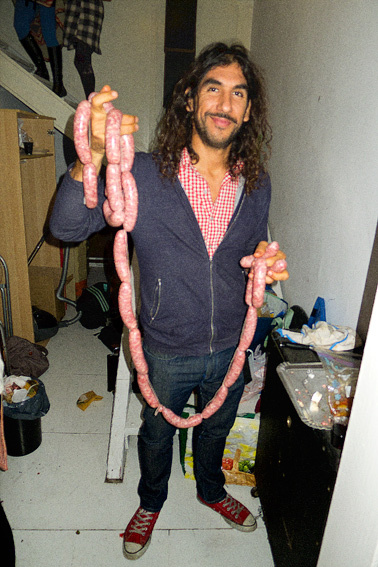 Late in the day, one of the Homage participants brought a long string of hand made Butifarra – a popular Catalan sausage (sported here by Alfredo). The Butifarra were generously donated to the cause – they’d already been photographed for the book. I was really looking forward to trying these special artisanal sausages but, having snagged the last one, a mother and hungry child looked imploringly at me… so I gave it up for another glass of Catalan black wine (vi negre). It seemed like a good day was had by all. More than 100 people came to be photographed and we noted that the Catalan participants had really engaged with the theme, probably due to a strong desire for independence from Spain and their own sense of Catalan national identity. 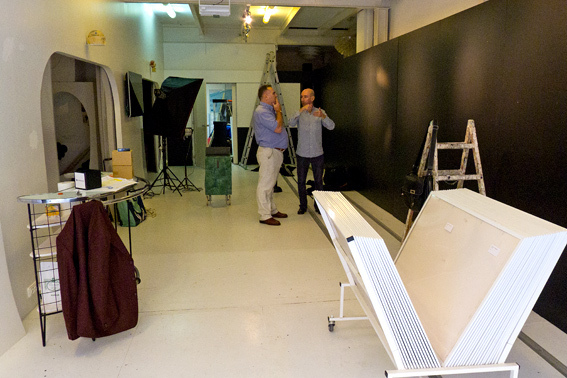 The number of collaborators exceeded that of previous one day book shoots in London and included all age groups. Rai was delighted when the Catalan radio station phoned and interviewed him regarding the event, during the afternoon. 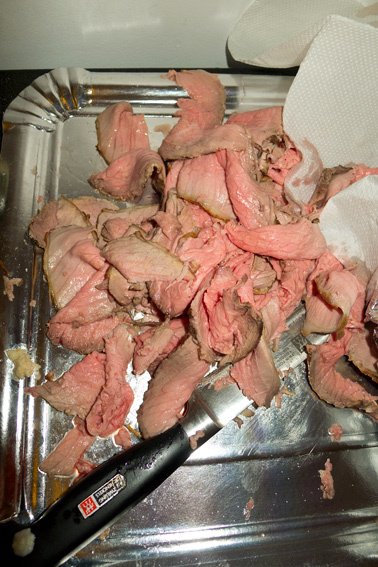 Once the photographs have been artistically edited and retouched, a book will be produced and launched with an exhibition at the Eat Meat Gallery – in April 2012. Having completed our mission, we retreated to Iposa for a welcome sit down, Spanish tapas and a few glasses of Rosado. 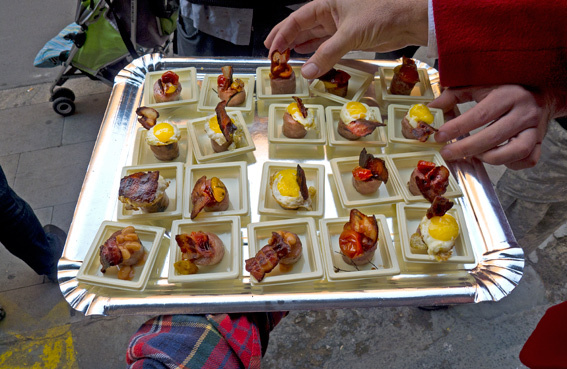 This entry was posted in Barcelona, Drink, Food, Meat, Spanish and tagged British tapas, Butifarra, Eat Meat Gallery, English Breakfast, Eton Mess, Homage to Cataluña, kedgeree, Olimax, Popcorn, roast beef. Bookmark the permalink. 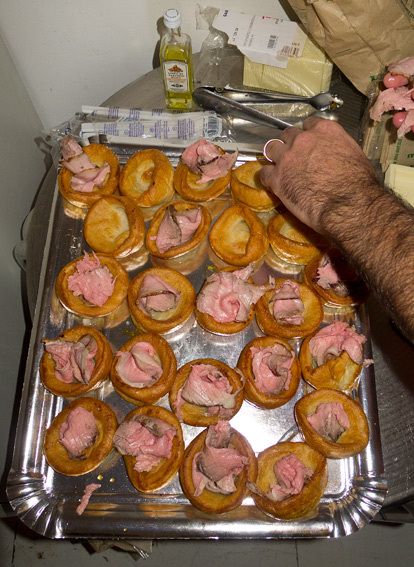 Thanks – they tasted fantastic and each tray full lasted about 2 seconds! What an amazing day – and so much hard work with all aspects of what you did. 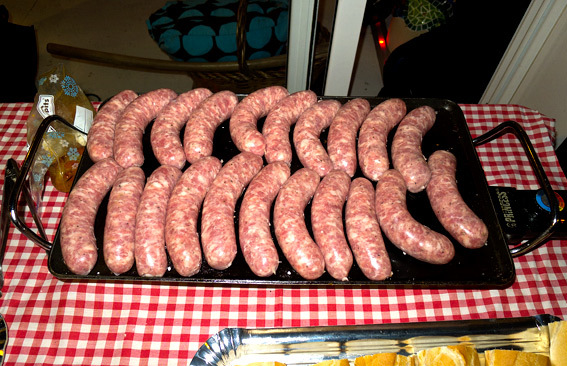 I´m so sorry we couldn´t make it…get Oli to do an Andalucian one in the future and we´ll be there clutching our chorizos! A cracking day, never thought I would have so much fun stuck in a cupboard with a hairy Argentinian dude. Those trays of tapas lasted for about 2 seconds once they left the broom cupboard! Ha ha, you guys did all the hard work, we just assembled it on the day and ate loads in the cupboard! We couldn’t have done it without you both and I’m glad you got to eat some!